President Recep Tayyip Erdoğan talks with Elon Musk (R) Tesla and SpaceX CEO, prior to their meeting in Ankara, Turkey, Nov. 8, 2017. 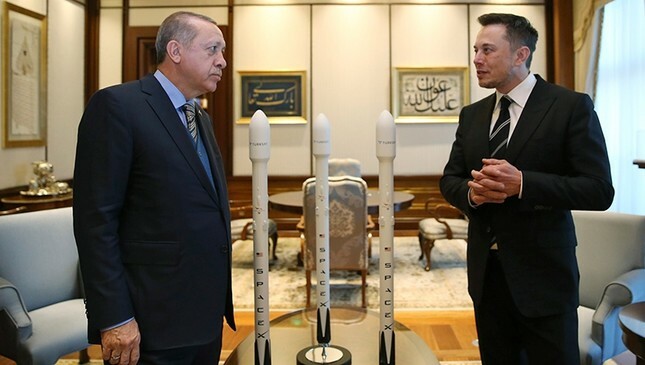 Following President Recep Tayyip Erdoğan's meeting with Elon Musk, the founder of giant corporations, including Tesla and SpaceX (Space Exploration Technologies), on Wednesday, Transport, Maritime Affairs and Communications Minister Ahmet Arslan announced yesterday that the TÜRKSAT 5A and 5B satellites will be launched into space by SpaceX's Falcon 9 rockets in the scope of an agreement that will be worth around $500 million. "Our friends decided to launch our satellites with the Falcon 9 rockets of Airbus sub-contractor SpaceX, and I congratulate them," Minister Arslan said during the signing ceremony between TÜRKSAT, A.Ş. and Airbus for the TÜRKSAT 5A and 5B satellites within the scope of the third Global SatShow in Istanbul yesterday. The agreement between TÜRKSAT and Airbus, which submitted the best bid to build the satellites in October, was signed by Airbus Defense and Space Systems France President Nicolas Chamussy, Airbus Defense and Space U.K. Managing Director Colin Paynter, TÜRKSAT Chairman Vecdi Gönül and TÜRKSAT General Manager Cenk Şen, along with Minister Arslan. Musk arrived in Turkey on Wednesday to discuss the mobilization of two new Turkish satellites, presidential spokesman İbrahim Kalın said yesterday. "Elon Musk came to Turkey to discuss the launching of the TÜRKSAT 5A and 5B satellites," he said. He was received by President Recep Tayyip Erdoğan at the presidential complex in the capital Ankara. The one-hour, closed-door meeting was also attended by Science, Industry and Technology Minister Faruk Özlü and Minister Arslan. Stressing that the project is very important for reinforcing developments Turkey has made in the satellite and communication sector, Arslan congratulated Airbus for signing this contract in a competitive environment. "What is important now is not what was before but what is after," Arslan said, noting that the task that falls upon TÜRKSAT and Airbus includes rapid placement of TÜRKSAT 5A and 5B satellites in their positions in orbit in 2020 and 2021, respectively, with the highest quality technology, while providing service not only to Turkey but also to the entire region and the world via TÜRKSAT. He highlighted that they attach great importance to this project and have high expectations regarding the outcome. "We care that TÜRKSAT engineers are taking part in this project and that TÜRKSAT 5A and 5B-related productions are made more in Turkey. We have already indicated this in contracts," Minister Arslan added. During his speech at the Third Global SatShow, Minister Arslan congratulated Airbus for its competitive endeavors in becoming a solution partner with Turkey, pointing out that the ministry expects Airbus to present an exemplary project on this issue for both future satellite launches and production. Arslan noted that launching the satellites is just as important as the production itself, also emphasizing the importance of satellite positions in orbit as well as lifespan. "For this reason, our friends decided to launch our satellites with Falcon 9 rockets made by Airbus sub-contractor SpaceX, and I congratulate them. I want to say that we are expecting a very successful launch," Arslan said, adding that a significant portion of the satellites will be produced by TÜRKSAT engineers via domestic facilities and that they will establish important cooperation with Airbus in Turkey thanks to the 5A and 5B satellites to be launched in three-to-four years, respectively. Yesterday, Chamussy said that the developments are important for the space technology industry amid Turkey's efforts to build its own space agency. "We are also very happy to be a long-term partner of this agency [TÜRKSAT]. It is also an exciting day for Airbus and Turkey because we are here for the future of TÜRKSAT 5A and 5B satellites," he added. Chamussy said that electric propulsion technology would be used for the satellites, a technology that reduces weight and doubles life expectancy, stressing that they are the world's safest company in this respect. Recalling that Airbus has been working with the Turkish aviation industry for many years, Chamussy said Airbus and Turkey's collaborations in this sector mark a first in determining the future of space exploration, suggesting that the Turkish industry will benefit greatly from this program. "The TÜRKSAT 5B satellite will be built at facilities located in Ankara. Institutions such as ASELSAN will make important contributions to this project regarding parts to be produced in Turkey," Chamussy said. "We promise to realize this technology with TÜRKSAT and Turkish partners in France at exactly the right time and performance. We all look forward to the launch in 2020." TÜRKSAT GM Şen said that he is honored to sign the production contract for TÜRKSAT 5A and 5B satellites, stressing that this is the result of intensive, meticulous efforts, while emphasizing that TÜRKSAT is taking an important step to become a globally renowned satellite operator in the new generation of telecommunications satellites. "We will take our place in the market as TÜRKSAT and continue to expand our scope by strengthening our satellite fleet in accordance with our 2023 goals," he added. Meanwhile, presidential spokesman Kalın said that the long-anticipated project for the country's first domestically produced car, announced by President Erdoğan, last week, was discussed with Musk, who also heads American automaker Tesla, during his meeting with the President Erdoğan. "Elon Musk's company is actually a major sustainable energy company. So, we talked about topics including new-generation batteries, solar energy and wind energy," he said. "We also discussed issues such as how to overcome traffic problems in metropolitan areas, digging tunnels and having underground traffic," Kalın added. Last week, the president announced that a consortium consisting of Anadolu Group, BMC, Kıraça Holding, Turkcell and Zorlu Holding would produce Turkey's first domestically manufactured car. The initiative came after repeated calls from President Erdoğan for a joint venture car project by the Union of Chambers and Commodity Exchanges of Turkey (TOBB) and the Science, Industry and Technology Ministry. President Erdoğan said the initiative group of Turkey's automobile will decide on the class, design, engine technology, model, production method and target markets for the production of the car. He also emphasized the possibility that Turkey could lean toward production of hybrid and electric cars, indicating that regardless of the decision, they will provide all kinds of support as long as the Turkish nation is adequately equipped to realize its dream.